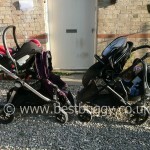 The Britax B-Dual 2011 side by side with the Baby Jogger City Select. Please note both have many recline positions and leg / foot rest positions and the best position for your child may not be shown. 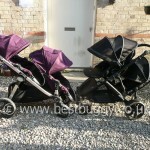 These two pushchairs are very suitable for either twins or a toddler and baby. 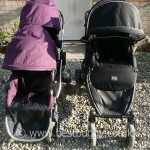 In many ways these two pushchairs are fairly similar. The chassis are a similar length, but the City Select front seat sits right over the front wheels whereas the B-Dual front seat is placed mid chassis. The B-Dual lower seat protrudes at the back by quite some distance, but amazingly I, nor my tall husband, have kicked the back seat as we walked. The wheels plus the wheel guards make the wheel base of the B-Dual a bit wider. We have found that the wheel guards are getting bumped and bent when trying to squeeze through doors. I believe the wheel sizes are the same, and both are non air tyres. 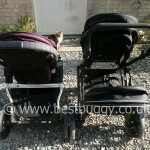 The seating positions on both pushchairs bring pros and cons. I like the good view that the City Select affords both children, but my daughter loves the “den” like underneath of the B-Dual lower seat. The B-Dual feels more like a single to push because the upper child is much nearer to you. A common criticism of the City Select is that it feels long, but as all these comparison photos are showing, it is very perceptional because of the front child being placed so far forwards. I don’t like the BJCS front seat facing outwards as I can’t see where the child’s feet are ie if they are dangling / sticking out etc. 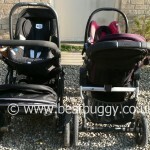 But the BJCS offers a huge number of seating positions whereas the B-Dual really only offers both seats forward facing, with the possibility of the upper seat parent facing if you have twins, or you use the infant carrier. The Baby Jogger City Select seats give better a seating position and footrest for my daughter. 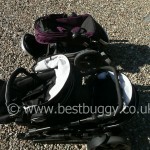 There is plenty of head room for her in both pushchairs, and both pushchairs have ways to make the hood even higher. She has plenty of room around her in both seats. The straps are longer on the BJCS, but they are also more fiddly to adjust. 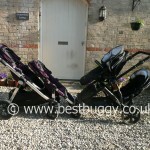 The B-Dual straps don’t have much room for growth but it is simple to swap the children around and readjust the straps. Both have good harness buckles. The City Select offers more seating positions, but only some allow you to recline both children. The B-Dual allows you to recline both children easily forward facing. There is no foot rest on the B-Dual which has been an issue for my eldest. The B-Dual is heavier both to lift but also to push when empty. But once you get the children on board, the B-Dual is the easier of the two to manoeuvre and also it drives in a straight line whatever the pathway is like. 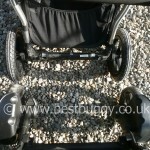 The Baby Jogger City Select will vere to one side if the pavement has a slight camber on it. 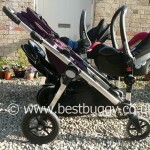 I can drive the B-Dual one handed whereas with the BJCS I keep having to bring the pushchair back to the central line. However the BJCS performs fabulously around a shopping centre. 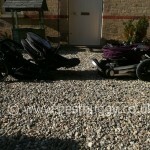 Both pushchairs are easy to turn on the spot. The BJCS is harder to manoeuvre around a supermarket and required constant tugging and pulling to bring into line. The B-Dual corners much better. The City Select is difficult to get up kerbs no matter where the children are sat. The B-Dual lifts easily up a kerb or step with the youngest child in the front, but not as easily with the eldest child in the front. Both pushchairs have fabulous hoods. I love the peekaboo mesh of the B-Dual hoods but practically I prefer the solid fabric of the BJCS for good sun / wind / rain protection and also darkness when trying to get the baby to sleep. There is more space between the B-Dual seats than the City Select Seats. However as I put at the start, moving the foot rest of the City Select, or changing the seating position gives many options, so if one position doesn’t work, then you can always change. I have to apologise because in the sideways close up of the City Select I forgot to drop the footrest so it looks like there is no leg space for the child. I am missing the parent facing option on the B-Dual. It is possible to turn the upper seat round, but it leaves so little space between the upper child’s feet and the lower child’s head that I deemed it as unsafe. But I love the proximity to my baby when using the infant carrier on top of the B-Dual. When the infant carrier was at the back of the City Select, I found it too high and I couldn’t see where my daughter’s feet / arms were at the front. 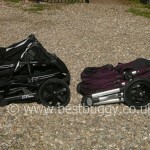 The infant carriers as pictured can go in either upper or lower positions on both pushchairs. 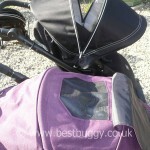 The infant carrier on the B-Dual is much simpler to align to put on, and very easy to remove by pressing one button and pulling. The Maxi Cosi Cabriofix requires a bit of lining up to put onto the chassis, but a tricky two handed manoeuvre to remove it. The B-Dual has a huge range of handle positions, from very low to very high. The handlebar rotates and is covered with foam. The City Select handle extends and has a good range. The City Select handle is covered with rubber. 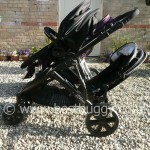 Both pushchairs have huge baskets with good access even with both seats on. I would suggest the Baby Jogger City Select basket is larger and better simply because you do not have to fit items around a child’s feet. 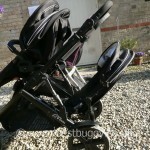 Access to both baskets is good though and these two pushchairs offer a very practical solution to shopping with two children, or going out for a day trip with rugs, blankets, coats, toys, picnic etc. 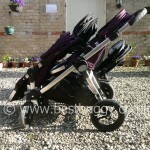 Both pushchairs are very sturdy and offer good support as you walk along. There is a huge difference in the folds. 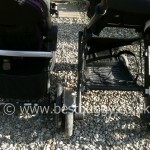 The Baby Jogger City Select folds down into a very neat chassis plus two seat units and adaptors, or the chassis with one or two seat units attached (I don’t recommend two because one seat unit will be in contact with the floor). The B-Dual again will fold as just the chassis, or with one or two seats attached. However the chassis is bulky, heavy and difficult to grasp to lift unless you use the bumper bar as a handle. But it is much simpler to open the B-Dual with the seats attached than to set the BJCS up (which to be fair only takes a minute to clip everything into place). The lower car seat adaptor frame for the Britax B-Dual is large to store whereas the City Select adaptors are small sticks. However you do not need the lower car seat adaptor frame for the B-Dual for a toddler and baby, because the upper adaptors are included in the package. 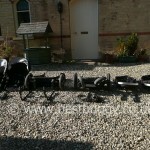 There are photos above of the two pushchairs folded with both seats on; with all the parts stacked into the neatest pile possible; and to show all the various pushchair parts. I love the B-Dual throw over raincover. It’s very sensible and practical. I just wish there was somewhere to store it on the pushchair without it living in the basket. It’s not a small item! However I prefer it to the individual tight fitting raincovers of the Baby Jogger City Select. 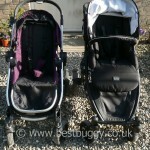 These can be fiddly to fit in a sudden shower, and hard to get around the lower seat if the children are facing each other or on the lower carrycot. I would love to see a throw over tandem raincover for the City Select. I wish the B-Dual had some mesh storage pockets like the City Select. I miss having somewhere to put a water bottle to drink as I walk along. Yes, there is the basket, but its too low and fiddly to get past the lower child, and I don’t want to keep stopping en route! I love the mesh pockets on the back of the City Select for bits & pieces like my phone, water, purse etc. without them being blatently on display. I added a parent console to the B-Dual but was conscious that my phone and purse were on show and were easy to remove. 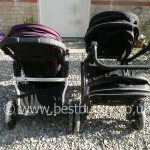 All round these two pushchairs are very comparable. They offer similar features and will accommodate two children, including newborn twins well. To sum up, I find the seats on the BJCS are a better shape for my children, but the B-Dual offers them more room between them. I prefer the choice of seating positions on the BJCS but I love being so close to both of my children with the B-Dual (especially with the infant carrier on top), and being able to see them clearly through the hood mesh windows. The B-Dual is quicker to set up and to fold, although to be fair the City Select will fold with two seats on – but its tricky and I wouldn’t advise it – one seat is fine though. However the B-Dual has a large bulky, hard to handle, fold and is heavier to lift – thankfully I have a lovely husband with strong arms. 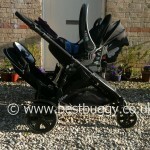 The Britax B-Dual handles much much better than the Baby Jogger City Select. 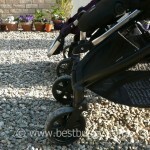 The B-Dual doesn’t feel as heavy to push once you are moving and the pushchair drives in a straight line without constantly needing adjustments. Both have huge baskets, similar wheels, and large hoods. For me, the Britax B-Dual is great if you do a lot of walking, whereas the City Select will take up less room, and be more flexible, in your car boot. 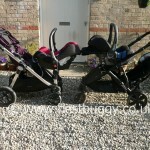 This summary of the similarities and differences should be used in conjunction with the other reviews of these two pushchairs on www.bestbuggy.co.uk to get a complete picture of each pushchair’s capabilities. *Edit* Not long after this review was written the BJCS became unbearably heavy to push and we had to stop using it. Our baby was only 10 months old. 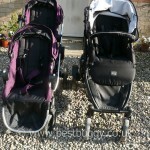 Many thanks go to Kooltrade (Baby Jogger) and Britax for their help facilitating this comparison.